Creating a comedy show like no other. For its third year of TAC’s partnership with the Melbourne International Comedy Festival, TAC asked Graffiti to find a creative solution that got attention and highlighted pedestrian safety. With over 700,000 people visiting the CBD during the Festival, it was vital to get the message out for pedestrians to ditch the distractions – which includes headphones and mobile phones – and pay attention while they’re on the streets. Our challenge was to strike a balance between entertainment and education, with a concept that would appeal to the diverse Comedy Festival audience. The result was to create something unique to the Festival - a walking comedy show. 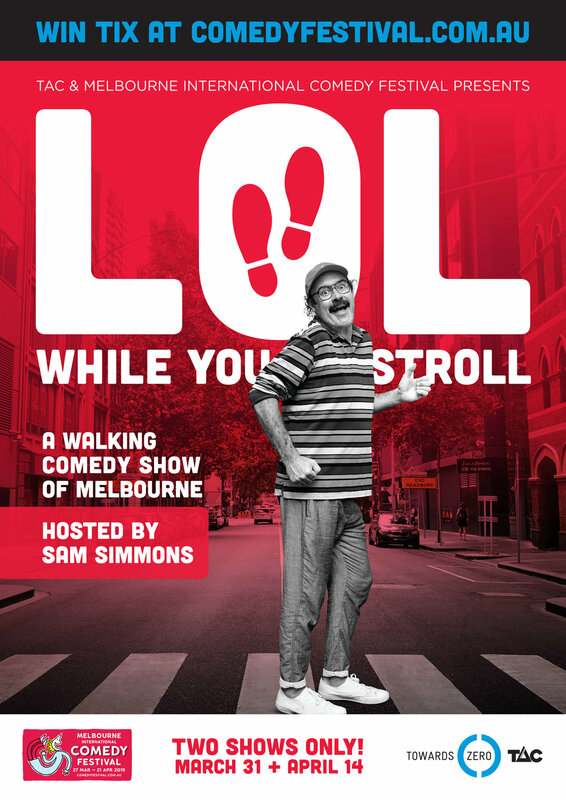 In his signature quirky style, prominent comic Sam Simmons hosted 40 competition winners across two ‘LOL While you Stroll’ Shows during the Festival. Totally focused, and phone-free, show-goers walked the streets of Melbourne accompanied by hilarious commentary from Simmons. Melbourne Comedy Festival favourites Mark Watson, Granny Bingo, Steph Tisdell, Rhys Nicholson, Nikki Britton and Aaron Gocs (who looked the part as the Lollipop Man) made cameo appearances along the way. Content from the shows was used throughout the festival on social channels of MICF and promotional partner, Nova100. Flamboyant drag icon, ‘Karen from Finance’ and well-known comedian, Lawrence Leung gave voice to the campaign, with content featured across out-of-home, social content and in-venue gig posters. LOL while you Stroll. A Walking Comedy Show. Large format pop up digital screen. Outside Melbourne Town Hall for four weeks.